Survey No. 19, Beside Vijaya Bank, Surabhi Layout, Yelahanka Old Town, Bangalore - 560064, Karnataka, India. 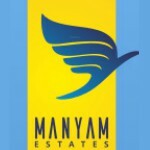 Manyam Estates Pvt Ltd is a leading player in Bangalore real estate industry. Everyone dreams to have our own home & we help many of them to make their dreams come true. We build each home painstakingly, with focus on Quality, Useful detailing & ensure Value for money. We desire to earn people's trust and confidence while we create whenever they launch their new product and services.